Is there a better alternative to Kanapp? Is Kanapp really the best app in Language category? Will Kanapp work good on macOS 10.13.4? 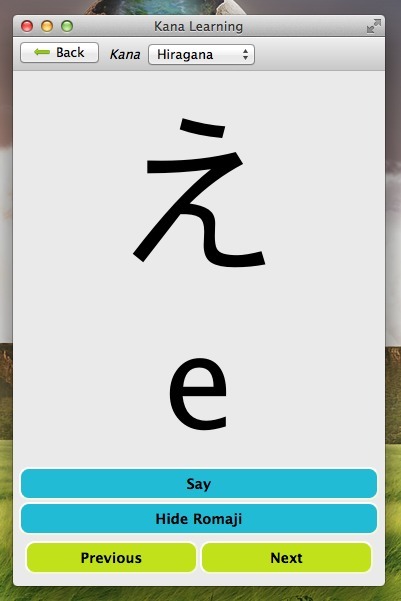 Kanapp is a little application which allows you to learn the Kana. You can also test your knowledge with the Kana quiz! It's the first release, so it may contain bugs. It's an open-source software because I don't have the time to maintain the application. You can get the sources on github: https://github.com/Adopi/kana-app. Note: Finder and MacUpdate Desktop don't report a version number for this app. The developer refers to it as version 1.2-en. Kanapp needs a review. Be the first to review this app and get the discussion started! Kanapp needs a rating. Be the first to rate this app and get the discussion started!